If you have some left over fabric laying around or some old sheets or both. You don't want to pitch them out but don't know what to do with them..well here you go. I actually have neither of the above taking up space anywhere so I went to the Goodwill and picked up some sheets for $2 a piece. A big thank you to those that do the donating! To keep things as simple as possible - my rugs are the no cut type. I rip the material/sheets into strips, the strips are knotted together instead of sown. To eliminate as many knots as I can - when I'm ripping a sheet from top to bottom, I don't rip the strip all the way to the end. Instead I stop ripping about an inch or so from the bottom - flip the sheet over and start with another strip. This way we have a continuous long strip instead of many single strips (hope this makes sense). 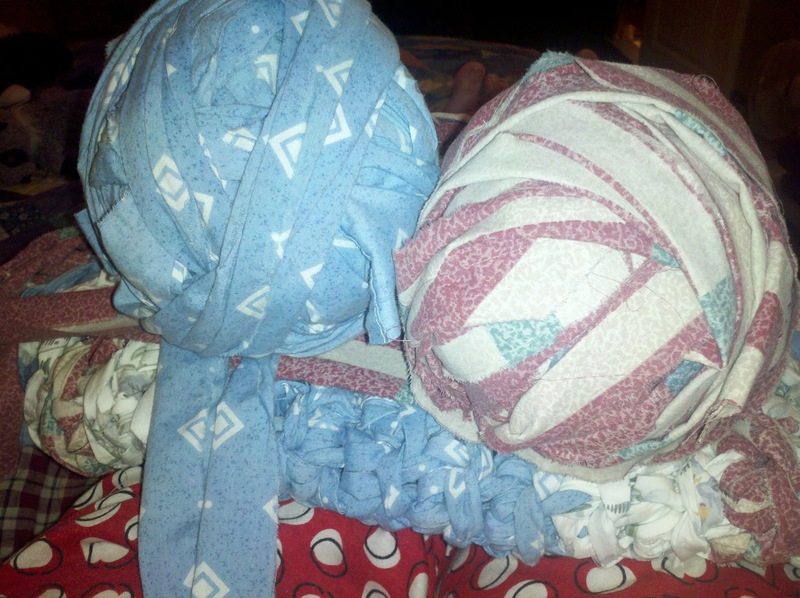 The strips are then rolled into balls of material and then crocheted. Depending on the width of the strips is what determines the size of the crochet needle I use. 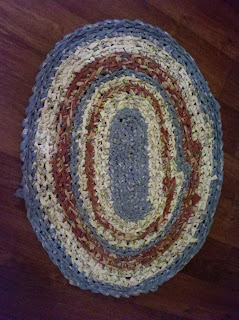 But I tend to like the big stitch/braid type look for rugs, so I use a rather large needle. I also have never followed a pattern or instructions of any kind so every rug is unique - in shape, size and color pattern. There apparently is a politically correct face-up side to a rag rug..but of course my side of preference to face-up is considered the under side. After lots of use however..the clean side is my side of preference :) We are discouraged to wash rag rugs - give them a good shake and just flip them over. I have some old rag rugs that are considered antiques and are literally dry rotted, I really shouldn't be using them. But if it doesn't get used around..it doesn't belong. So I use them and absolutely love to sink my toes into them and a bit of history each and every day. There will come a time when washing them is a necessity - so below is a bit of care advice from another rag rug fan. I've also heard laying them in the snow and patting them until the snow is no longer brown is a simple, safe way to clean them..so maybe once a year I'm able to do this for mine. We need more snow! 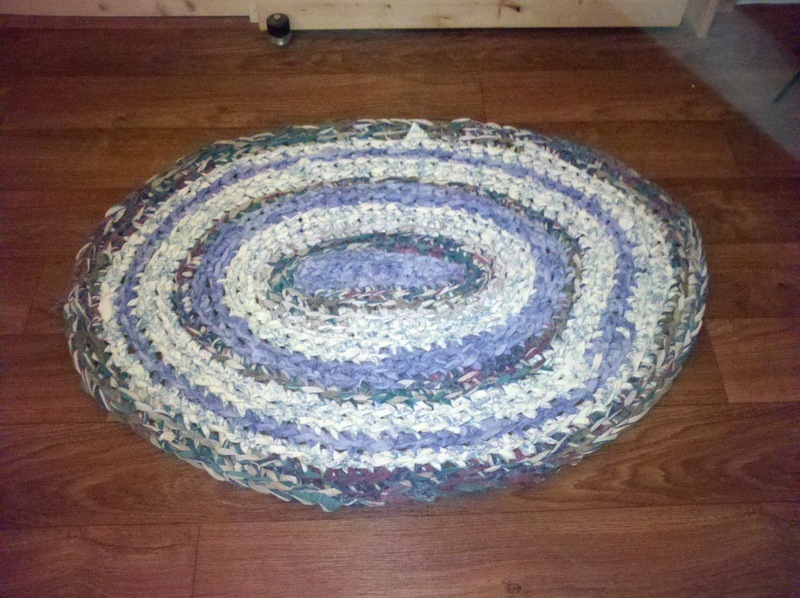 I also line dry my rag rugs and they always have to be reshaped a bit when throwing them back on the floor. I started making rag rugs when I young teen - rugs have always fascinated me. 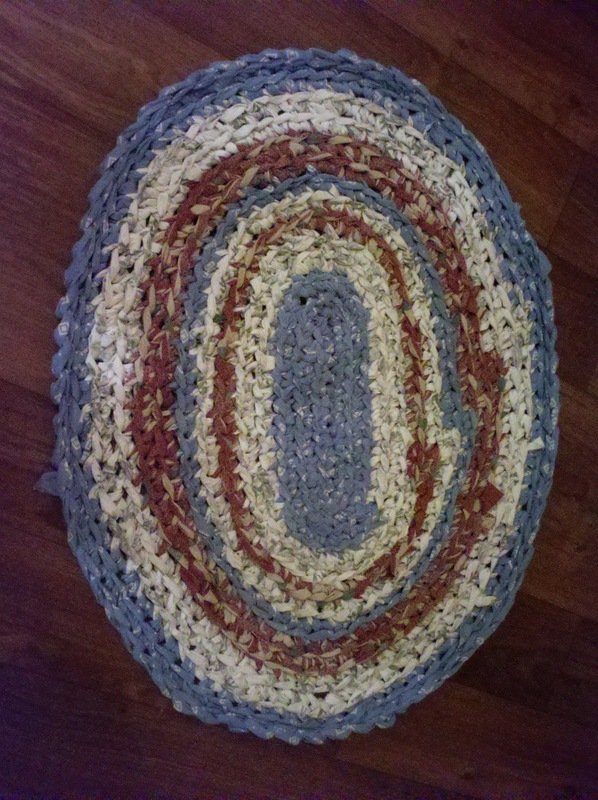 I have several that were made with yarn too, these also have stood the test of time but my favorite by far is still the beautifully unique, repurposed rag rug. Rag rugs were popular from about 1890 to 1910. Influenced by the "Arts and Crafts" movement. rag rug making gained interest. Once again rag rugs are making a come back. a delightful touch as an accent to any room within your home. 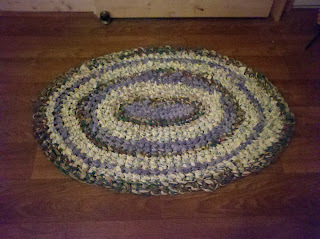 and hand crocheted into a beautiful rug. 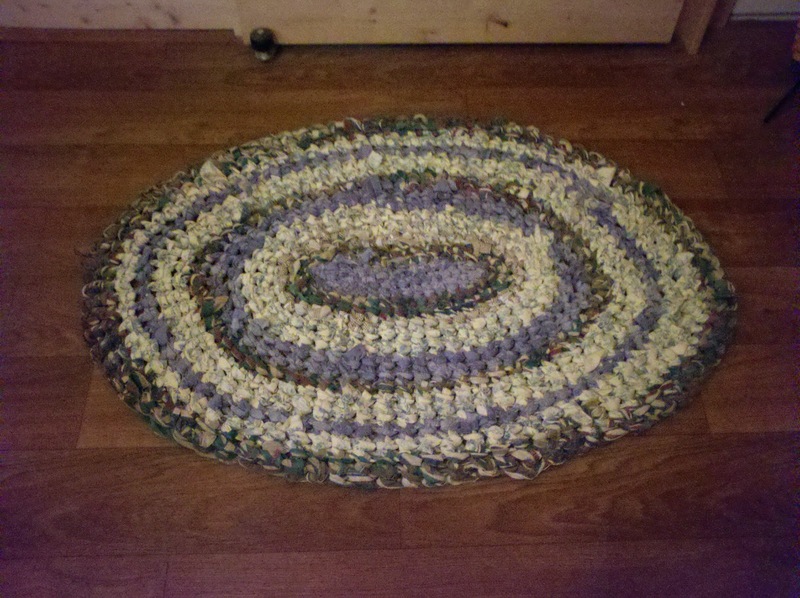 Rag rugs are very durable, yet they become softer with each washing. using a mild detergent. (Not much detergent is needed). in cold water with a least 1 cup of vinegar within your washing machine in the largest amount of water. (X-Large or large load). Agitate for about a minute or so. Then, let your machine do the rest. Your rug can now go into the clothes dryer on a low setting until almost dry. Remove and lay flat on top of the dryer or on the floor to finish drying. You may need to give your rug a tug or two to reshape. If you see any strings, do not pull, simply snip them with a pair of scissors.